GEORGE TOWN, Cayman Islands - Sept. 21, 2018 - PRLog -- Later this year, Ammeris is delighted to be launching a green-powered blockchain as part of the wider Ammeris Platform. This ledger (the Ammeris Blockchain) is meant to serve as the first iteration of Ammeris' solution-stack and will act as a general-purpose database to support various smart contracts and decentralized applications (dApps) through Ammeris' public marketplace. The ledger uses the ethash "proof-of-work" (PoW) code but is permissioned for hosting purposes as it aims to achieve sustainability goals. I'd now like to take a moment to clarify why we have gone with PoW for the Ammeris Blockchain and how this ledger serves both as an integral economic function by introducing a renewables-backed cryptocurrency, and a utility component by providing capital markets infrastructure for the overall solution being built by both Ammeris and our partners. *For more info about Ammeris' technology, including the solution-stack, please visit www.ammeris.com/blockchain. The discussion here does not purport to be a complete listing of the facts and ideas. 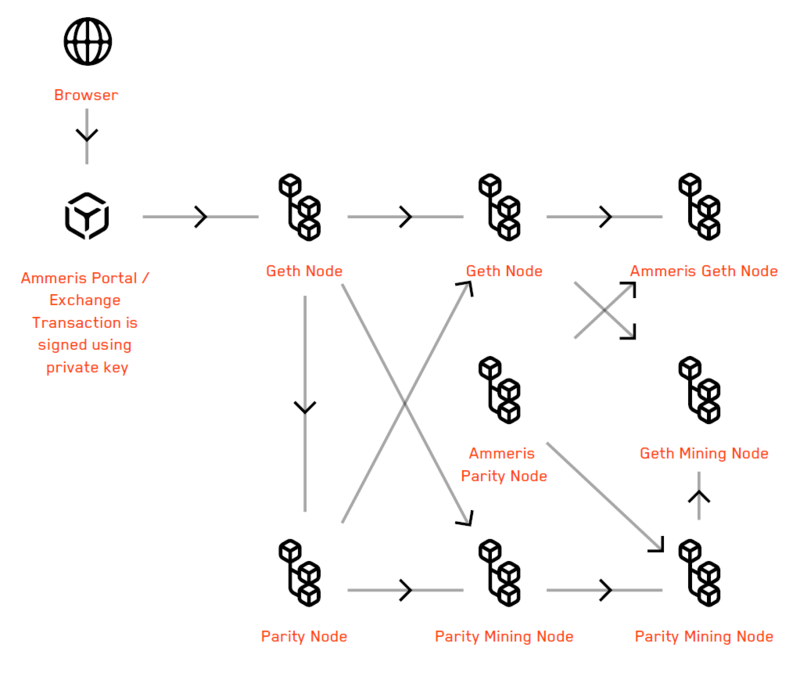 The Foundation is set to publish the Permissioned Node enrolment program later this year at www.ammeris.com/foundation, which will allow data centres around the world that are powered entirely by renewable energy to host the Ammeris Platform. The launch of the Ammeris Platform is an evolutionary, but massive step for us as an organization that is incubating and working on various projects that are developing blockchain and crypto-related businesses. At our core, we became frustrated with many of the challenges of developing commercially viable businesses in the crypto and blockchain space, so we decided to launch our own infrastructure platform and tokenize it (see Ammeris whitepaper, section 2 and 3 for detailed explanation). To further illustrate the source of this frustration, it's worth noting that the latest figures on Ethereum show only 6 applications with more than 300 users, while more centralized platforms like EOS - which boasts a high transaction throughput for millions of users - in reality hosts only 2 applications with more than 300 users. Blockchains today lack adoption and real users. In large part this is because they are simply not conducive to hosting applications. In response to this environment, Ammeris is pushing a public solution that takes existing knowledge, open-source technologies, and custom code, and stirs them together to create an alternative tokenized platform geared toward breaking down the boundaries between the world of business and blockchain. We're gearing up to host real-world business that is set to easily break the Ethereum and EOS figures cited above, combined. Where our approach is different from others, is that we provide a solution that offers scalability and interoperability through segregated or partitioned ledgers accessible via API. We're also technology-agnostic, so expect to see the green platform grow alongside your favourite code. This all boils down to the fact that developers will no longer need to worry about the nuances of their database configurations, or whether their digital assets or data will become trapped on a platform destined for abandonment or forking. Gone are the days when a project with a single ledger attempts to serve the complexity of commerce. 3. a platform that rewards stakeholders through the Ammeris Portal, of which allows stakeholders to hedge against the inflation built-in to the system (5% in the first year and decreasing). 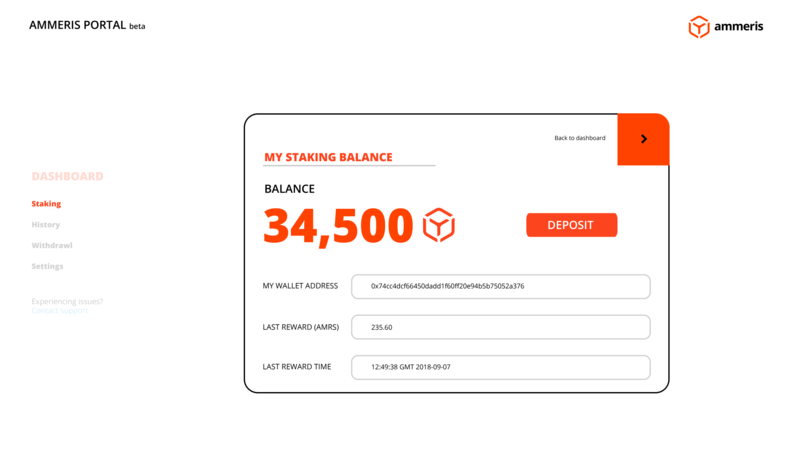 Together, the Ammeris Blockchain and stack form a complementary solution. Now, let's dig into some of the details of why PoW works here. One of the major problems facing publicly-accessible ledgers is denial of service attacks. When Nakamoto released the Bitcoin whitepaper back in 2008, PoW was the method of choice to keep spammers away from attacking public networks. Dedicated computing capacity is used to execute a series of "hash" operations until the native algorithm solves a cryptographic puzzle. This way, a degree of work results prior to processing transactions, thus keeping the database from getting overloaded by requests. For a network that offers a set of development tools including smart contracts, defending from endlessly "looping" code is even more important, and ensuring that computational work takes place will help to defend against debilitating and costly network congestion. In effect, PoW becomes part and parcel of any good public ledger solution. For this reason, PoW was chosen as a hardcoded governance model that ensures that the Ammeris Blockchain serves as a publicly-accessible database for the deployment of smart contracts and early-stage dApps that will eventually take full advantage of the stack. It doesn't boast high performance, because it doesn't need to.